The northern hemisphere of Saturn's largest moon, Titan, is set for fine spring weather, withpolar skies clearing since the equinox in August last year. The visual and infrared mappingspectrometer (VIMS) aboard NASA's Cassini spacecraft has been monitoring clouds on Titanregularly since the spacecraft entered orbit around Saturn in 2004. A group led bySébastien Rodriguez, a Cassini VIMS team collaborator based at Université Paris Diderot,France, has analyzed more than 2,000 VIMS images to create the first long-term study ofTitan's weather using observational data that also includes the equinox. 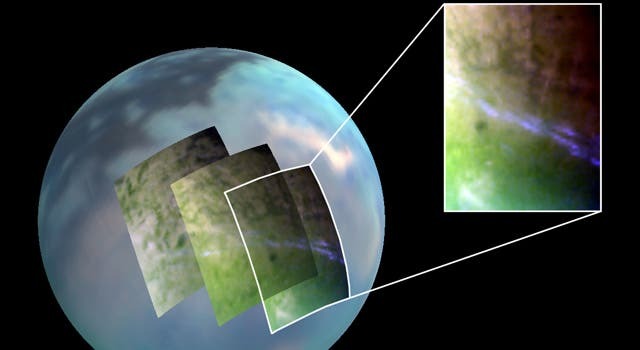 Though Titan's surface is far colder and lacks liquid water, this moon is a kind of "sisterworld" to Earth because it has a surface covered with organic material and an atmospherewhose chemical composition mirrors that of an early Earth. Titan is the only other place in the solar system other than Earth observed to have a hydrological cycle with standing liquid on the surface.On Earth, lake levels rise and fall with the seasons and with longer-term climate changes, as precipitation, evaporation, and runoff add and remove liquid. Using data gathered by NASA's Cassini spacecraft over a span of four years, the researchers—led by graduate student Alexander G. Hayes of the California Institute of Technology (Caltech) and Oded Aharonson, associate professor of planetary science at Caltech—obtained two separate lines of evidence showing roughly a 1 meter per year drop in the levels of lakes in Titan's southern hemisphere. The decrease is the result of the seasonal evaporation of liquid methane from the lakes—which, because of Titan's frigid temperatures (roughly minus 300 degrees Fahrenheit at the poles), are composed largely of liquid methane, ethane, and propane. "It's really exciting because, on this distant object, we're able to see this meter-scale drop in lake depth," says Hayes. "We didn't know Cassini would even be able to see these things." A season on Titan lasts about seven Earth years. Rodriguez and colleagues observed significant atmospheric changes between July 2004 (early summer in Titan's southern hemisphere) and April 2010 (the very start of northern spring). The images showed that cloud activity has recently decreased near both of Titan's poles. These regions had been heavily overcast during the late southern summer until 2008, a few months before the equinox. Over the past six years, the Cassini VIMS team found that clouds clustered in three distinct latitude regions of Titan: large clouds at the north pole, patchy clouds at the south pole and a narrow belt around 40 degrees south. "However, we are now seeing evidence of a seasonal circulation turnover on Titan — the clouds at the south pole completely disappeared just before the equinox and the clouds in the north are thinning out," Rodriguez said. "This agrees withpredictions from models and we are expecting to see cloud activity reverse from one hemisphere to another in the coming decade as southern winter approaches." The Cassini-Huygens mission is a cooperative project of NASA, the European Space Agency and the Italian Space Agency. JPL manages the mission for NASA's Science Mission Directorate, Washington, D.C. The visual and infrared mapping spectrometer team is based atthe University of Arizona, Tucson.